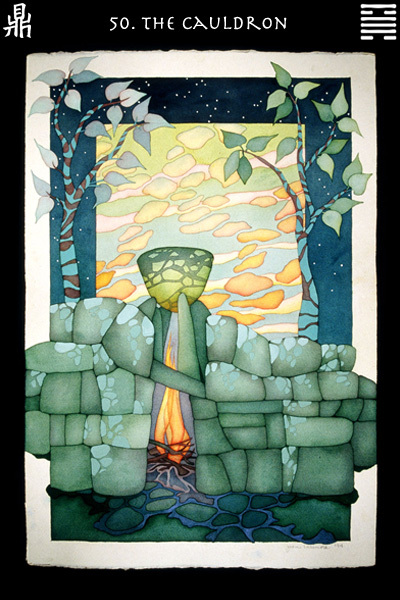 The cauldron symbolizes nourishment and rejuvenation. Sooner or later, good comes to those who do good; joy comes to those who bring humor to others; opportunity comes to those who persist in their dreams. Rejuvenation is a returning to one’s natural desires and the recharging of batteries that comes with progress towards aspirations. This reading suggests nourishment and transformation for people of goodwill. Great good fortune and success are indicated here. Healthy, regular sustenance is vitally important, as symbolized by the cooking pot, which provides nourishment to all. When the cycle of humanity reaches its apex, each person’s sustenance comes in the form of fulfilling his or her deepest needs and desires. Rejuvenation means that worthy men and women of talent are properly nourished and valued. When society is functioning properly, such people are supported and encouraged to contribute to their best abilities. A fresh approach to old habits is indicated. Look for ways of putting new life into old forms. Only when great vitality is present, can real breakthroughs be achieved. If you are virtuous and talented, you will succeed -- even if you are in a humble position at the moment. Cleanse yourself of inferior traits such as pride or excessive concerns about money; and be open-minded to other people even when their worst traits are showing -- they still may have something to teach you. If sadness or grief has been a part of your life recently, use the depth of emotion underneath the situation to nourish your soul and clarify your vision. You are confident and may be able to secure some measure of prosperity in the near future. At the same time, you could experience some envy and mistrust from others in the process, but that is their problem. This is your moment, a time for you to achieve something. There is no real danger now. Limit your attention to the challenges -- and opportunities -- in front of you. You are impeded in your progress. Resources are being squandered; perhaps your talents are not being recognized. But if you meet difficulties with a good attitude, the challenges will be overcome. Sure, you may be confronted with obstacles -- perhaps even some loss -- but good fortune comes in the end to those whose character is solid. Some aspects of character, resources or helpers are insufficient to the challenge before you. Either someone was not fully trained or properly prepared for the task, or just did not commit to it wholeheartedly. Insufficient talent or resources -- coupled with large plans -- can spell disaster. Modest people can find helpers if their humility is coupled with true ability. Good fortune comes to those who can combine great talents with a mild temperament. Continuing with a modest attitude is the most productive way right now. Profound advice is transmitted from a sage to a worthy disciple. Remain open to wisdom; it is as real as the wind (even if its sources are just as unpredictable). Great good fortune results from open-mindedness and receptivity, and all goes well.